Data were collected fall 2011 and hence only available in the Supplement to The 2011 ESPAD Report. 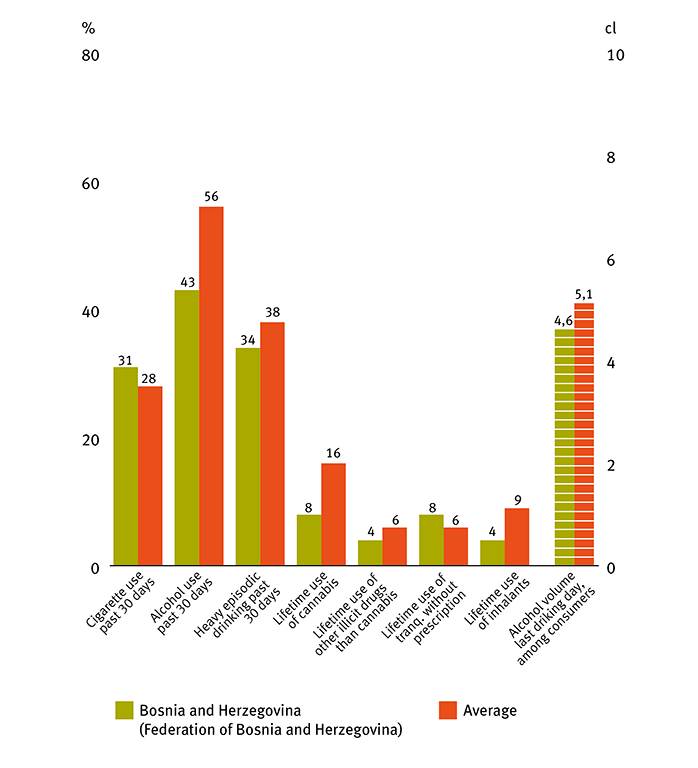 With two exceptions students in Bosnia and Herzegovina (Federation of Bosnia and Herzegovina) report lower levels of substance use on the key variables, compared with the ESPAD average. The levels are particularly low for lifetime use of cannabis, other illicit drugs than cannabis and inhalants. Compared with those variables, the three alcohol-related measures were closer to average but still definitely below. However, for cigarette use during the past 30 days and lifetime use of tranquillisers or sedatives without a prescription the figures are slightly higher than the ESPAD average. The overall picture of Bosnia and Herzegovina (Federation of Bosnia and Herzegovina), in the ESPAD perspective, is a little mixed with low figures on most variables but a bit above the ESPAD average on two.